Hello, and welcome to JT Hughes Honda in Shrewsbury. 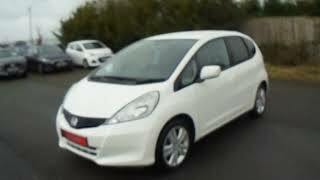 Today I'm going to show you around our used, very clean Honda Jazz. Now, this is the ES Plus spec, finished off in the white paint. Start from the rear of the car, a real quick look in the boot. As with all Jazz it, it does come with quite a large boot space. On this spec, you do also get privacy glass in the rear, 15-inch alloy wheels. And again, being the Jazz, it does come with Honda's Magic Seats. 60/40 folding, with the added benefit of them being able to be lifted up and secured into place. And being a Honda Approved vehicle, it will come with 12-months warranty, with the option to upgrade that to 24 at a cost of £295. At the front of the vehicle, you've got halogen headlights. Come to the interior, it comes with a multi-function steering wheel with cruise control, electric adjustable side mirrors, CD player with FM and AM radio, climate control, modern-day connection points. And this is the 1.4 petrol, with a 5-speed manual gearbox. Again, being a Honda Approved vehicle, flexible finance options are available, as well as service plans available with our service department. If you have any further questions about this vehicle, please give us a call, and we'll do our best to help you out. Thank you.